With the rise of the culinary culture and awareness, the world seems to be filled with plenty of foodies these days. So what does a world full of foodies do? They eat; and hunt down the most expensive dishes in the world; so that’s exactly what we did. 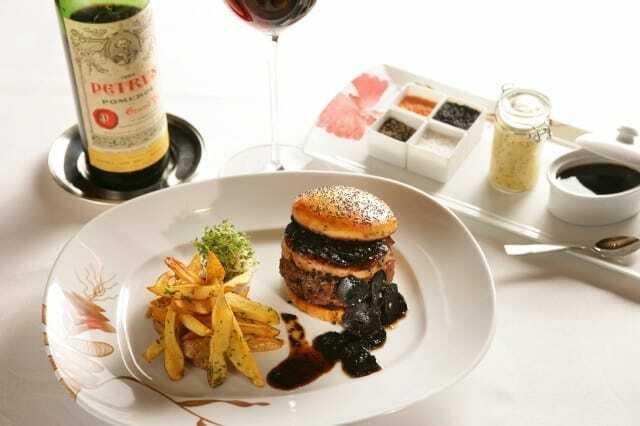 Here’s a list of the most delicious and extravagantly expensive dishes in the world. We never thought a single dish could cost so much, but then again there are dishes here with ingredients that are not usually edible! Bon appétit, y’all! 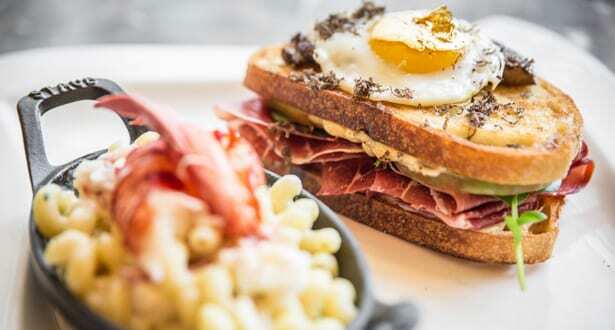 The $100 grilled cheese sandwich is offered on the menu of Chicago restaurant, Deca Restaurant + Bar. The restaurant is situated within the Ritz-Carleton hotel and is called the ‘Zillion Dollar Grilled Cheese’. So why is this dish so expensive? The cheese they use is 40-year aged Wisconsin cheddar that they say is “infused with 24k gold flakes”. They also add a white truffle aioli sauce, and balsamic vinegar aged 100 years. Oh and they serve it with a side of lobster mac n’ cheese. Holy tastebuds! The Manila Social Club decided to take a stand when it comes to doughnuts. 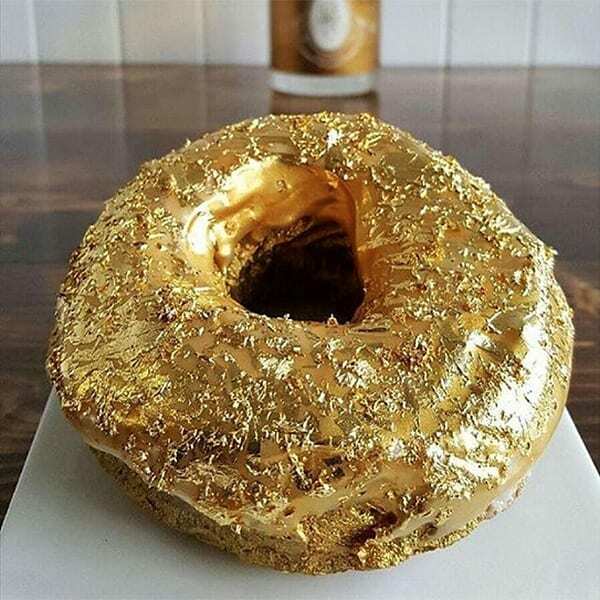 Their $100 doughnut looks positively glowing in all its gold. 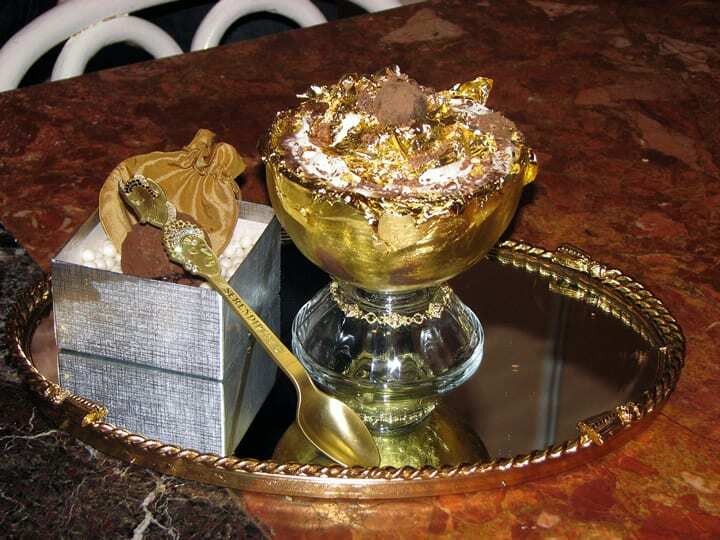 The pastry is dipped in Cristal champagne and 24K gold leaf and filled with mousse and champagne jelly. Honestly, we would totally try this one out, it sounds too interesting to pass up. Yes, $100 is pretty expensive, but nothing close to the most expensive dish on this list… not even by a long shot! The $100 oysters actually make sense and are not that surprising. 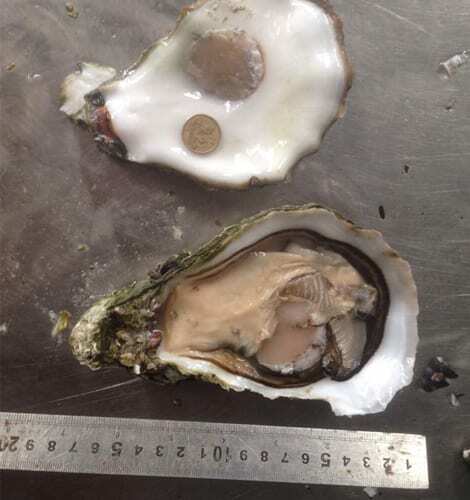 The reason EACH oyster is so expensive is because the Coffin Bay, Australia native oysters are huge. Unlike other oysters, these are at least 18 centimeters long and weigh around 1 kilogram (that’s a lot). They are usually served as is with a side of lemon slices for extra flavor. Oysters are typically served in the most high end restaurants, and we see why. 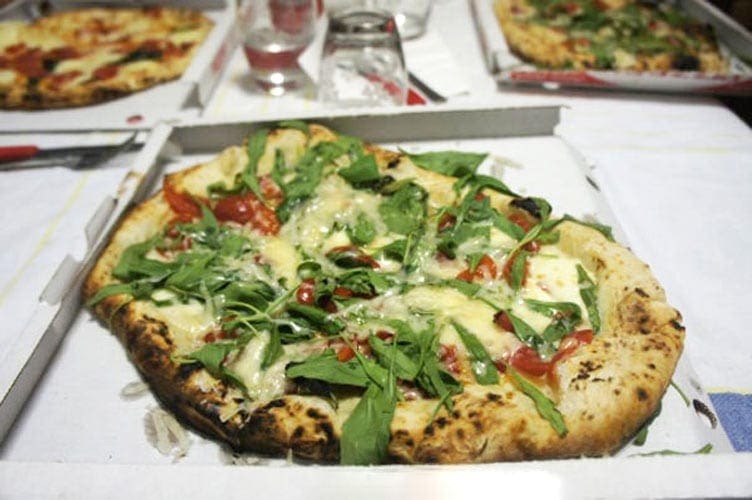 The second most expensive pizza is from Maze, Gordon Ramsay’s restaurant in London. The pizza is covered in onion puree, mozzarella, white truffle paste, mizuna lettuce, fontina cheese, cep mushrooms, pancetta, and adorned with a rare Italian white truffle; would you expect anything less of Gordon Ramsay? After what we’ve seen him do in the kitchen on his cooking competition show, we expect nothing less than the highest level of success in his dishes, otherwise we’ll yell like he does on tv! 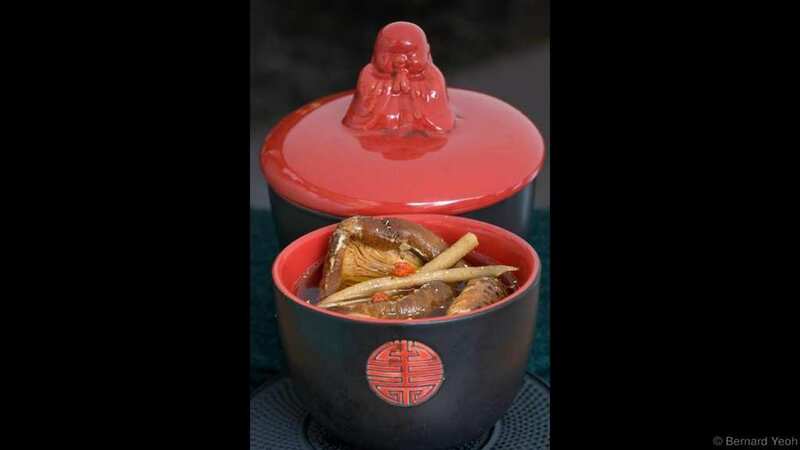 Kai Mayfair restaurant is the supplier of the most expensive soup. The dish is called the ‘Buddha Jumps Over the Wall’, not sure why, but is made up of chicken, shark’s fin, Japanese flower mushrooms, , dried scallops, abalone, sea cucumber, pork and ginseng. The soup has to be ordered at least five days before you are set to pick it up; they take this soup business very seriously. The soup is very interesting sounding for sure, and five days to make it is sure to make it very flavorful. The fancy hot dog is made by Tokyo Dog in Seattle. They take the concept of this American staple to a WHOLE new level! 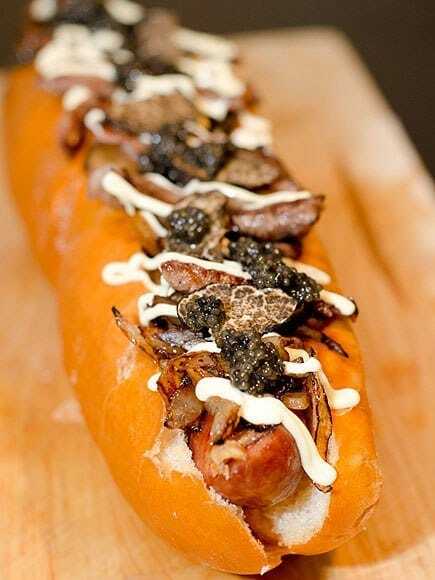 The hot dog is made of Wagu beef, foie gras, and caviar with an bit of shaved black truffles to top it off. It really does sound and look extremely appealing. This dish has entered the Guinness book of world records as the most expensive hot dog on the planet. Bar Masa in New York holds the record for most expensive sushi roll. This one consists of large and fatty pieces of tuna, added caviar, rice and avocado, all wrapped together in perfectly sized chunks. It all sounds pretty standard to us but the restaurant takes care to get the highest quality of caviar around, as well as top notch tuna. 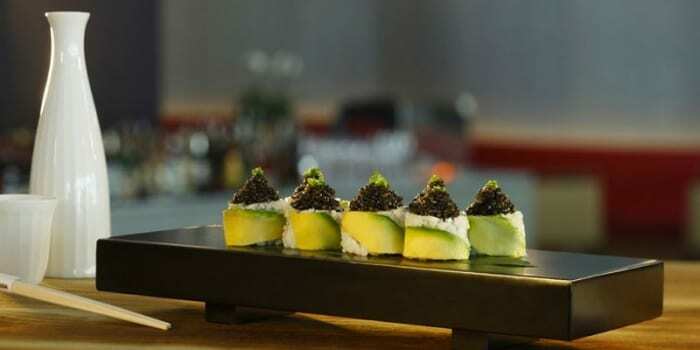 Oh, the dish is called ‘Masa Toro with Caviar’, just in case you’re into it and want to get yourself an 8 piece roll. So we love popcorn more than most other foods, so this popcorn ‘dish’ makes us want to jump into a tub of it! 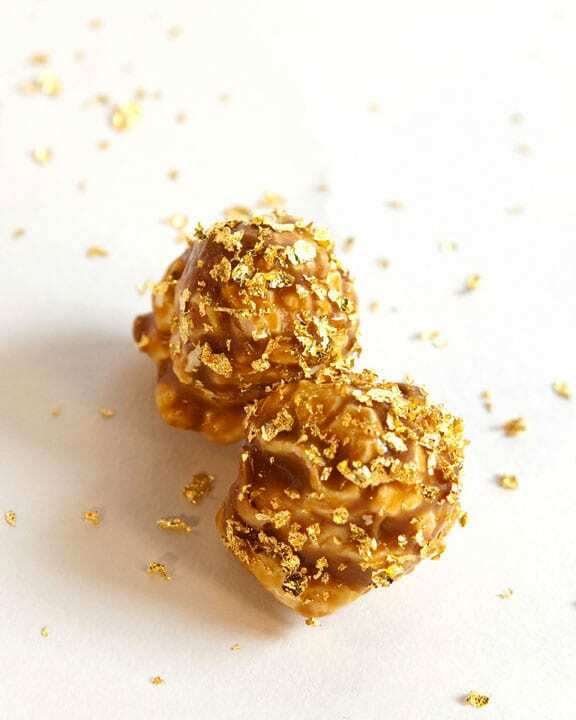 The self named “Billion Dollar Popcorn” is called that because the corn treat is dipped in caramel and salt from the island of Laeso, and dusted with edible gold flakes. This perfect combination of salty and sweet is $250 for a one gallon tin. Now for those of us who aren’t about spending so much money on popcorn, good news – you can buy just one kernel costs $5! That’s what we like to call winning! A $350 steak is eye popping but still a hefty price of a piece of meat. This steak, served at Old Homestead Steakhouse in New York, is 12 oz Japanese Kobe beef. That’s it. The $350 is just for the cut of meat (that comes from a cow that was massaged daily and drank beer, yes, beer), but they guarantee it to be the best tasting, most tender steak you would ever put in your mouth. 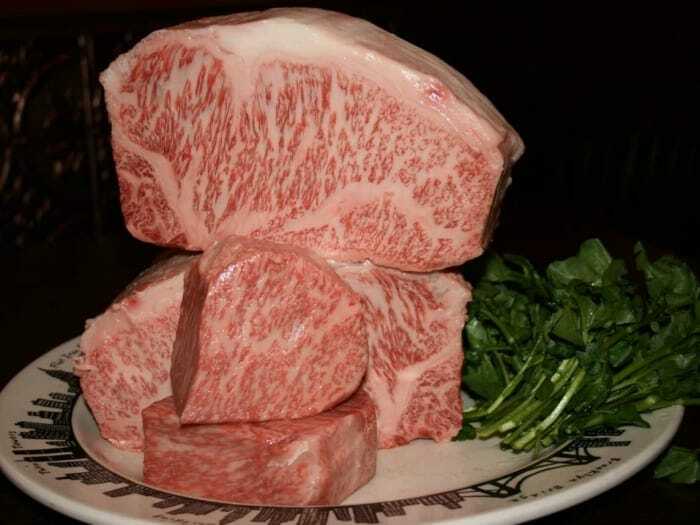 We’ve heard of Kobe beef, we don’t doubt it’s quality, and we would probably give this a shot. After bonus season of course. This fish pie is made with the best of the best in terms of ingredients. The fish within the pie was poached in Dom Perignon champagne, in addition to what makes up the rest of the pie – scallops, oysters, salmon, Turbot, and white truffles. 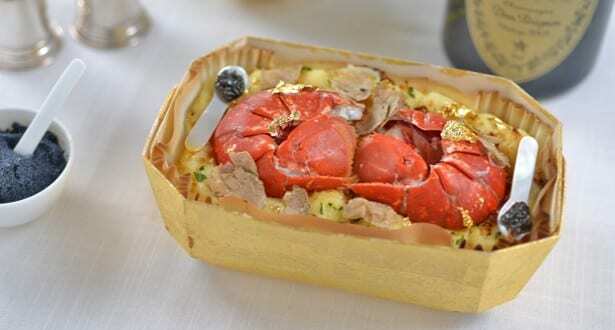 They top it off with lobster tails, gold flakes, and two mother of pearl spoons holding caviar. Come on! This dish didn’t stand a chance in terms of cost, the ingredients alone cost a fortune! This burger is the brainchild of New York City food truck 666, hence the price of the dish. The name of it though, is the ‘Douche Burger’. Hey, they named it, not us. 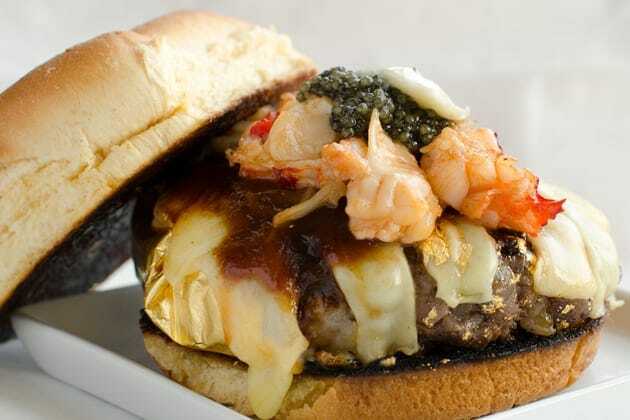 The owner of the truck explained that the burger is made up of “Kobe beef patty (wrapped in gold leaf), foie gras, caviar, lobster, truffles, imported aged gruyere cheese (melted with champagne steam) kopi luwak bbq sauce and Himalayan rock salt.” YUM. So where is the location of the most expensive cupcake on earth? Dubai, of course. Bloomsbury’s Cupcakes in Dubai is the mastermind behind this chocolate expense. The cupcake is made from the best chocolate money can buy (literally) and is wrapped in gold, edible gold. To be more specific, the sweet dish is made up of 23 carat gold, highest quality Ugandan vanilla beans, Amedei Porcelena cocoa and, not to ruin the quality of this incredible dessert, organic flour and butter imported from England. $1,000 for a frittata, that’s pretty steep, we agree, but lets investigate. Norma’s Restaurant at Le Parker Meridien Hotel decided to make this delicacy for its quality diners. First of all the lobster alone is one of the most expensive things about this dish, the restaurant flies these babies in from out of state as fresh as can be. 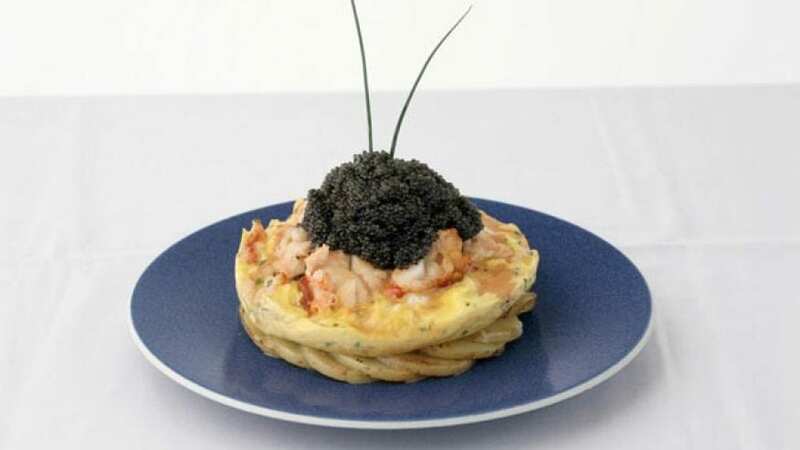 The other element of this dish that make it so pricey is the topping of Sevurga caviar, which is considered the best quality of caviar you can get (originating in the Caspian Sea). The restaurant responsible for the most expensive ice cream sundae is also responsible for the most expensive hot chocolate (detailed later in the article). So, ice cream at $1,000, Serendipity 3 decided to use Tahitian vanilla ice cream that’s infused with Madagascan vanilla beans and pieces of hard to get Chuao chocolate from Venezuela. On top of all of that goodness are Amedei Porcelana chocolates, and an added gold-covered almonds, chocolate truffles, and fawned over with 23-carat edible gold leaf. They then add a mother of pearl spoon for you to use, as you dip it in the Baccarat crystal goblet. Extravagant as it gets. Guess what makes this the most expensive bagel. That’s right, GOLD. We’re used to bagels with cream cheese and salmon, and that’s fine too, but the Westin Hotel Bagel has instead – goji berry infused jelly, white truffle cream cheese, and topped off with gold leaves. This is not your usual New York bagel to say the least. 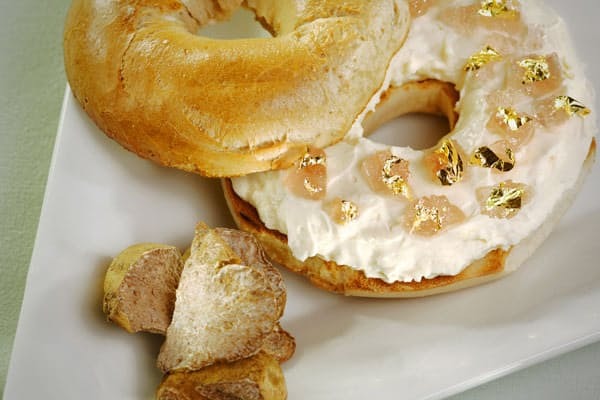 Would you spend that much money on a bagel like this? We probably would, just for sheer curiosity as to how it tastes. Coq au Vin is basically chicken in wine, so what makes the folks at Coq d’Argent in London think they have a chicken dish so fabulous that they can charge $1,500 for it? Well, the chicken itself. The kind of chicken that is served is Bresse chicken. Apparently these birds are very rare and therefore expensive and tasty. Another aspect to the dish is the wine part. The chicken is left to marinate in Le Chambertin Grand Cru, Trapet 2009 for a full 24 before it is prepared. It better be out of this world, mind blowing, can’t breathe kind of delicious. Curry is usually a cheap dish you get when you want a quick and delicious meal. Not here. Bombay Brassiere made a dish called ‘Samundari Khazana Curry’ that costs a whopping $3,200! 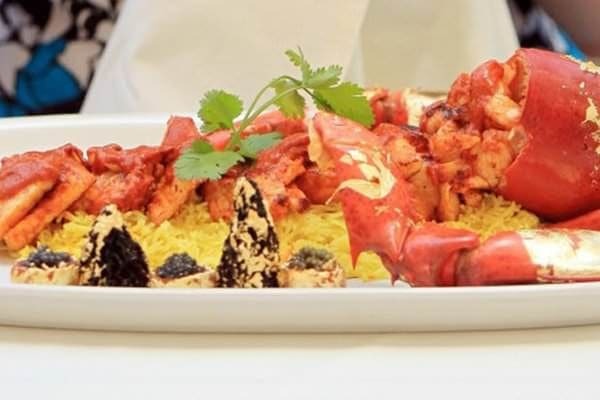 To be fair, the dish is much more than curry, it consists of Devon crab, Beluga caviar, white truffle, and gold leaf on top of the main show – a gold-coated Scottish lobster, abalones, and quail eggs filled with MORE caviar. WOW. Well what have we here? The most expensive pizza! Margo’s Pizzeria in Valletta, Malta, is the one responsible for this one. This pizza is tomato free, as the owner said that it doesn’t taste very good with all the gold. 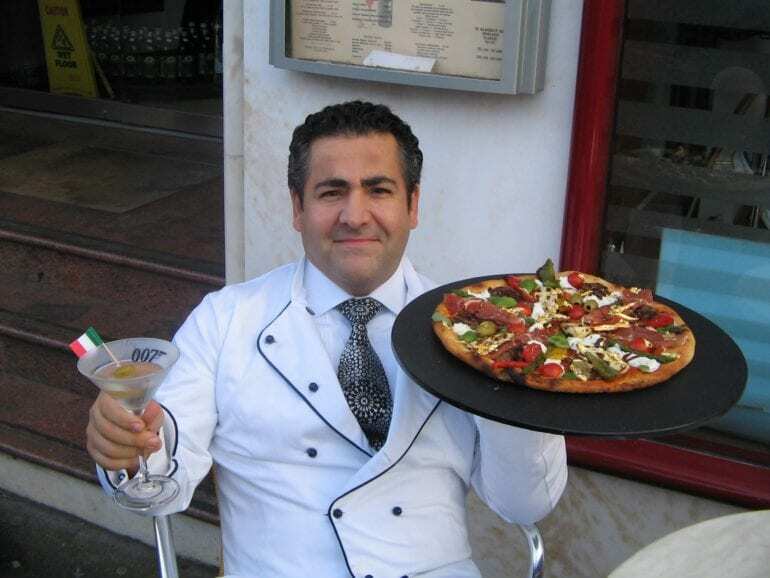 The pizza is a thin-crust style with white truffles, buffalo mozzarella, and 24-carat edible gold leaf. 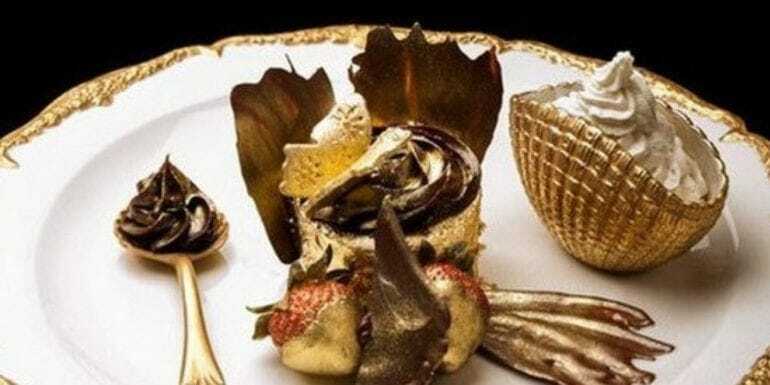 We are starting to see a pattern in the most expensive dishes on the planet – lots and lots of gold. Sheesh. Well, well, well. We love burgers as much as the next person, maybe even a little more, but we would never pay $5,000 for one! However, in the quest over curiosity, we found out this burger, made in Fleur in Las Vegas, is made out of Wagyu beef and foie gras. The meat is then topped off with shaved black truffles and truffle sauce (truffles for days over here!) within a brioche truffle bun. Not going to lie, we can practically taste the truffles as we write this. For all watermelon lovers out there, this one’s for you. 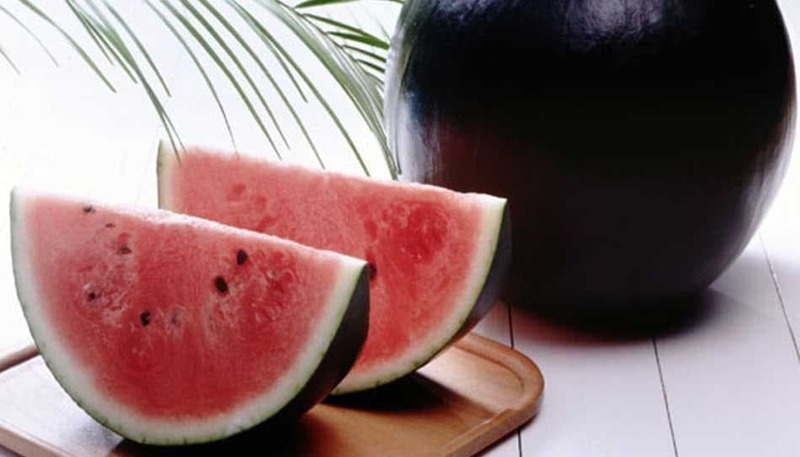 The Densuke watermelon is a unique fruit that is only grown in Hokkaido, Japan. Each watermelon weighs in at 17 pounds! The reason for the price is not only for the fact that each season only harvests a few dozen of these fruits, but they are known to be the absolute sweetest in their juiciness. Great. Now we’re on the hunt. The The Fortress Resort & Spa in Sri Lanka are responsible for this extravagant dessert. 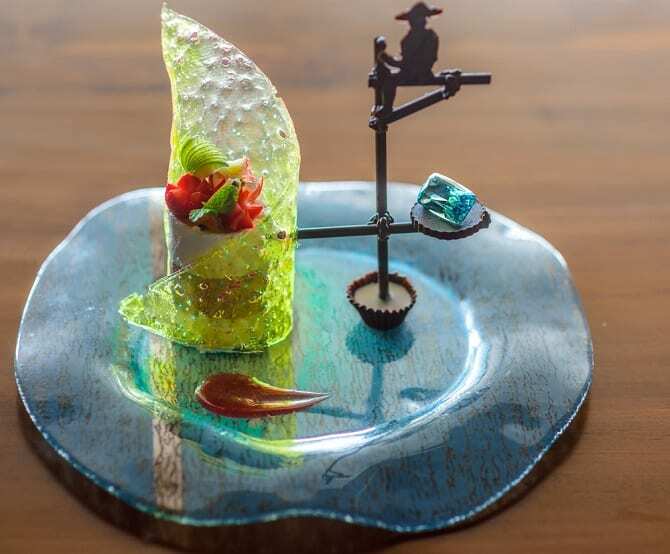 The dish is made up of gold leafed Italian cassata, with an added fruit-infused Irish cream atop a fruit compote, a Dom Perignon champagne sabayon at the bottom of the dish and a handmade chocolate carving of a local stilt fisherman. So what makes this so darn expensive? The fact that they add an 80 carat Aquamarine stone to the whole deal. We guess you can’t eat the stone but it’ll look mighty fine on someone! Seems legit, $25,000 for a frozen hot chocolate. Right? This dish is called ‘The Frrrozen Haute Chocolate’, like haute couture, get it? Anyway, the restaurant Serendipity 3 is the brains behind this chocolaty dessert. This dish, in all it’s extravagance is expensive because Serendipity decided to use 14 of the rarest and priciest cocoas originating in Africa and South America, and shavings from the most expensive truffle on the planet, called the La Madeline au Truffle. 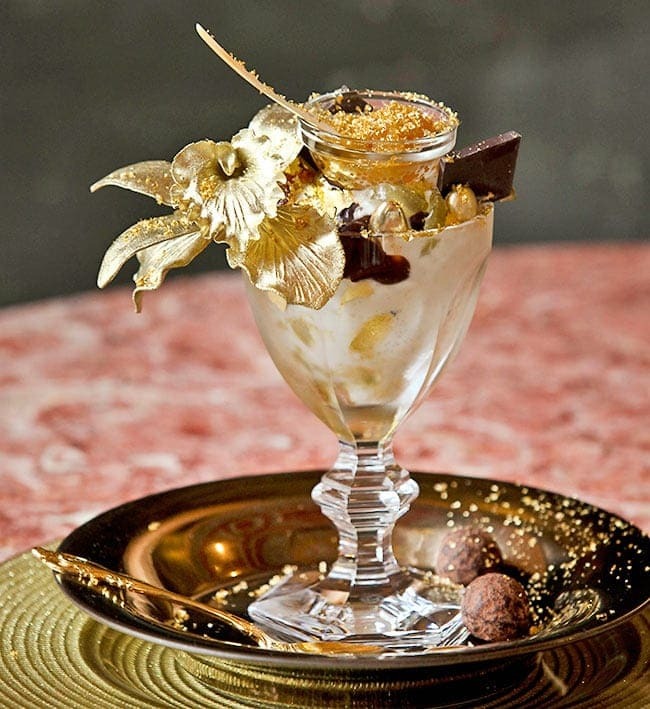 The dessert is thens served in a baccarat Harcourt crystal goblet that is laced with 23 carat gold and arrives with an 18 carat gold and diamond bracelet attached to the goblet. Well the last part explains the cost! Lindeth Howe Country House Hotel decided to one up every other chocolate dish in the world and make this one. This entire dish is encased in a chocolate Fabergé egg and has to be ordered two weeks in advance. 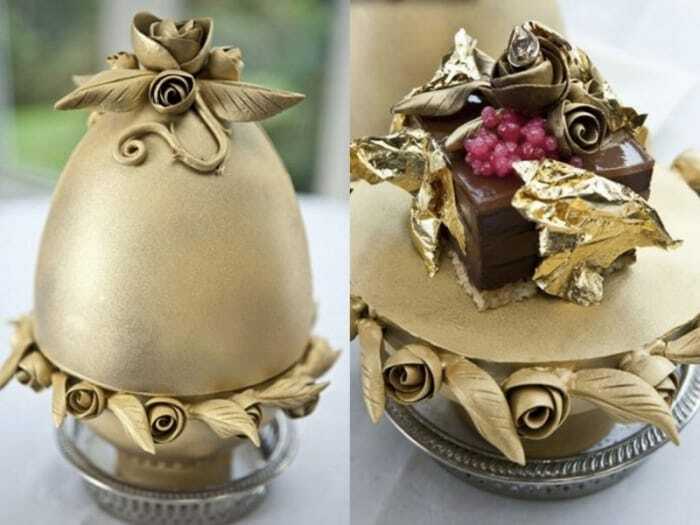 Within the egg, there is a chocolate and champagne jelly, layered to perfection, topped off with gold leaf and caviar. However, what makes this baby $35,000 is the diamond that is placed on top of the whole dish. Well, duh.